the result does look very pretty! 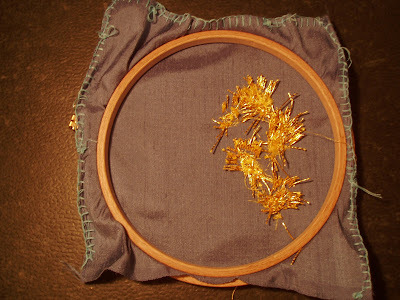 i haven't got any experience with gold thread so far, so i wouldn't know which one to use best! Machteld, you might want to try 'turning' the gold thread on the surface of the embroidery, instead of taking it through to the back on the edges. That would avoid the gold threads at the back; its hard to explain without a drawing! I think that historically, far less gold should be at the back - as it was so expensive. (Certainly this is the case with tablet weaving). You might want to try an English company called Benton & Johnson for thinner gold threads - they have a huge selection. The work you've done is really beautiful! The problem with this purse is, that as far as I can see, the gold thread does not turn on the surface. (I know what you mean, I've seen drawings demonstrating the technique you mean). So another option maybe is that it turns underneath the seruface? 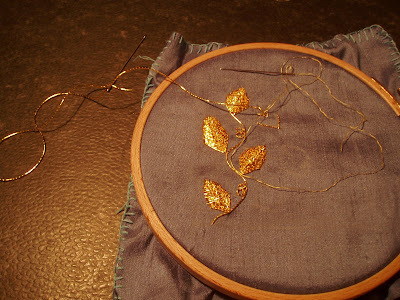 Maybe when using thinner goldthread that is more flexible this can be easily done? The leafs are very small (2 cm) and Japanese .5 mm is a bit too coarse, Turning was not an option with such small items and/or such coarse gold thread. I'll take a look at Benton and Johnson! I don't know if this is still of any use (because of the date),but you should try and google Ulrike Mullner at Voorschoten. She gives courses in metal thread sewing and is specialised in restoring those metal thread embroidery's. She really know's almost everything about it and has sources to buy thread also! She gave me lessons and they where really good!